Coastal Industries was founded in 1972 with the mission to create the industry’s finest bath and shower enclosures . Located since its inception in Jacksonville, Florida, Coastal’s manufacturing operation is housed in the most advanced and efficient bath enclosure production facility in the world. Please note that a 20% restocking fee applies to all returns not of manufacturer error. Designed for clients & projects - the premier showroom in North Florida and a leading plumbing supplier for the area, hollingsworth decorative plumbing has an eye-catching storefront located in the heart of the design district in downtown Jacksonville, Florida. Duval County's Versatile Kitchen & Bath Fixtures | 36 + Years! Established in 1939, Ray Ware Hardware specializes in Door Hardware, Plumbing Fixtures, and Finely Crafted Cabinet Hardware. Family owned and operated for 4 generations, we offer only those product lines sharing our commitment to quality design and manufacturing standards. Ray Ware, our founder now deceased, opened the business in 1939. He was one of the first in Jacksonville to gain certification as a hardware specialist through the American Society of Architectural Hardware Consultants. In the 1940’s, the Ware family and the Kuder family joined by marriage and a couple of generations later, Jason Kuder is now at our helm as President. Our residential division boasts a public showroom with one of the largest displays of cabinet hardware in the state of Florida and our knowledgeable staff has over 55 years of combined experience in plumbing, cabinet and door hardware and are ready and eager to assist you, your designer, and/or your builder. Whether it’s one hard to find cabinet pull or hinge or entire house of plumbing and hardware, we can walk you through the process, help you find fit and finish and make you glad you came. In addition to our residential division and showroom, our thriving commercial division has joined forces with the area’s most prestigious contractors to help build and expand some of the most notable and beautiful properties on the first coast and beyond. We’re locally owned and operated so it matters to us that you are pleased with your purchase and your experience. Come and see us. At D.H. Custom Cabinets, we've built our livelihoods on remodeling people's homes. From the simple to the lavish, we've experienced it all and we can help you every step of the way. No job is too small or too big for our knowledgeable crews. We've happily done it all for 37 years now! Dependable Plumbing & Drain Cleaning is dedicated to providing high quality plumbing services such as leak detection and drain cleaning to Duval, Clay, and St. Johns County. Our licensed plumbers are ready to deliver a variety of plumbing installations and repairs, including 24 hour emergency service. Our drain cleaning services in Jacksonville handle leak detections, Sewer Smell detection (smoke testing), slab leak detection, camera inspection, septic repair, septic pumping, water heaters, irrigation sprinkler repair, Drain cleaning, sewer jetting, plumbing repairs, repipes. We provide home accessibility remodeling for the elderly and disabled. We do this though our compassion and desire to help those wishing to stay I'm their own homes for as long as possible. Offering unique home decor solutions and creative home enhancements. Stainless steel is in our DNA. Our engineers and designers are obsessed with it. It is also our business. It has been so since 1963, when the first stainless steel sink, then a luxury product, was manufactured at our factory. The rest, as they say, is history. We have since then graduated to producing a range of luxury stainless steel products that have been lauded for their originality and design aesthetic. The current collection is comprised of a unique range of Designer Stainless Steel Mosaics available in over 100 designs and the largest collection of Stainless Steel niches in North America, the Y | S H E L F. The Y | S H E L F by Neelnox is available in over 32 sizes and styles. The mosaics and the Y | S H E L F are available through a nationwide network of exclusive dealers. Kitchen and Flooring Concepts has a combined experience of over 6o years in Jacksonville specializing in all types of floor covering products for both Commercial and Residential clients. We handle hardwood, laminates, ceramic, porcelain and stone, as well as commercial and residential carpets and vinyl. If it pertains to floor covering, Kitchen and Flooring Concepts carries it. Our design capabilities for kitchen and bathroom remodeling is exceptional. Our state of the art design software is the best in the industry and allows us to customize any and all details of your kitchen or bathroom project. We offer turn key projects from demolition to installation and completion. We are the original one stop shop for all of your interior remodeling. We design cabinets, counter tops and flooring all in our Jacksonville showroom. We offer customer service that is hard to find anywhere in this industry. We work our projects from beginning to end. Our clients are our life blood and we will always make them our priority. Use the Houzz Professionals listings to find Jacksonville, FL kitchen and bath accessory vendors. Don’t rule out asking a kitchen manufacturer’s design team for help, too. Skills often can be overlapped to save you time and money! 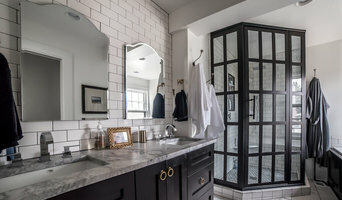 Here are some related professionals and vendors to complement the work of kitchen & bath fixtures: Kitchen & Bath Designers, Kitchen & Bath Remodelers, Interior Designers & Decorators, Cabinets & Cabinetry. Find kitchen and bath fixtures and accessories, plus installation experts, on Houzz. Check out Florida kitchen products and installers, and bath plumbing products and installers, on Houzz. You can also look through project photos provided by Jacksonville, FL renovators, retailers and designers.